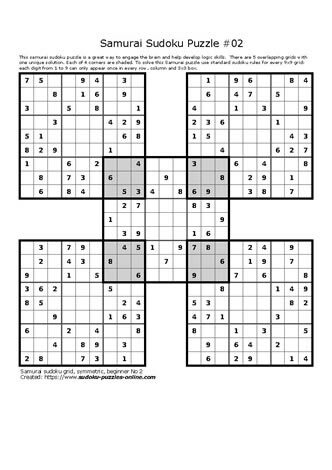 Samurai sudoku puzzle might also be known as an extreme sudoku puzzle. This interconnected 5 sudoku grid brain teaser is just what the doctor ordered to help keep the mind active and finding solutions to puzzles. Use logic and basic sudoku rules to solve this extreme sudoku puzzle. To make things more fun, challenge family and friends to see who can be the first to solve the puzzle.